In Buenos Aires, the Museo del Cine – a small and relatively unknown museum – is working valiantly to save some of Latin America’s most valuable creative heritage. Dedicated to Argentina’s cinematographic history, the bulk of the collection currently consists of tens of thousands of film reels and video cassettes that are disintegrating and fading into obsolescence. Ravaged by war, the preservation of Syria’s documentary heritage is a critical priority, yet this mammoth task is being carried out by just a handful of displaced Syrian professionals, who, despite being far away from their homeland, remain connected to it through sounds and images. And in another part of the world, a dirge-singer is working diligently to keep Kenyan funeral traditions alive by preserving her performances in accessible sound and image archives. Stories of such struggles are not unique and tend to elicit sporadic responses. Yet in a climate of unpredictability and rapid technological change, can underfunded cultural institutions around the world win the race against time and technological obsolescence, or will our collective memories and diverse creative expressions perish and pay the cost of inaction? SOIMA: Unlocking Sound and Image Heritage is a web-based and freely downloadable book that offers tips and advice from dedicated professionals from all corners of the world, for the preservation and creative use of sound and image heritage. Featuring compelling case examples and strategies founded in evidence-based research, this resource will interest collectors, users and educators alike. Within the pages of this work, the authors explore the diversity of sound and image collections, and highlight innovative, creative and cost-effective strategies for coping with constant technological change and meagre resources. The topics are as diverse as the authors, who come from fifteen different countries and institutional contexts. 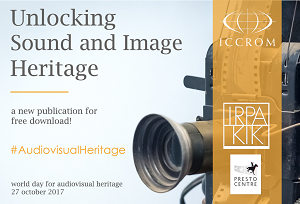 A joint effort of ICCROM, the Belgian Royal Institute for Cultural Heritage (KIK-IRPA) and the PrestoCentre in the Netherlands, this publication is a compilation of articles drawn from the SOIMA 2015 International Conference held in Brussels. Some 140 conference attendees, representing 41 countries and 95 institutions collectively upheld that collaboration and exchange between institutions and specialists is the key to unlocking sound and image heritage. The 2015 SOIMA conference was a reflection of the impact and progress of the SOIMA: Safeguarding Sound and Image Collections programme, on the eve of its 10th year. Initiated in 2006 by ICCROM, SOIMA is the only capacity building programme of its kind in the world, training professionals for preservation and the creative use of mixed media collections. The programme has built a small yet robust network of professionals in over seventy countries.